Copy provided by: Library (audio), own a copy of the book as well. Why I read this: I just love this books, especially on audio and I've been meaning to reread these and catch up on the series. Plot: Jacky is now a secret agent and infiltrates the French army to hopefully find some information. They tried to force her into becoming a lady spy by seducing men, but she wouldn't put up with it and disguised herself and forced them into letting her work by pretending to be a boy. Nothing Jacky does is easy and she finds herself devoted the men she has to lead and eventually even meeting Napoleon himself. But how will the English take it when they find all this out? Another great adventure full of action, adventure and Jacky winning over the devotion of many men once again. I just love how she gets herself into tough spots and gets out of them without much trouble. This was an exciting continuation of Jacky's adventures and she definitely proves her worth over and over again. Characters: I love Jacky, as always, but in this one she meets a new group of young men that you start to love. She can't help falling a bit for a dashing young man she works with in intelligence and her crew of untrained men can't help but become utterly loyal to her. Ah, Jacky, gotta love her. She's spunky and definitely clever. 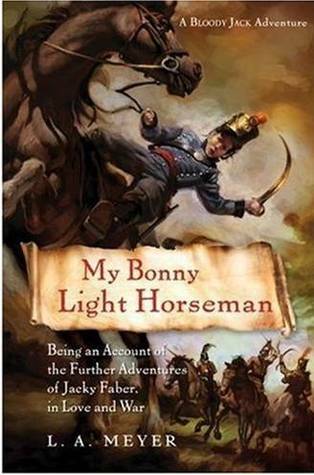 Relatability: Fans of adventure, history, and romance will always enjoy one of Jacky's many adventures. Cover Commentary: Love it. :) Puts you right into the heat of battle, don't it? I still have to get to this one! I really want to listen to it, but my library does not have it in stock yet. I want to carry on in this series, but since the first one I listened to as an audio, and my library doesn't have the rest, I haven't moved on. Jacky definitely has the knack for making the right kind of friends.